Start off your visit on the 2nd (Thu): admire the landmark architecture of Sainte-Chapelle, pause for some serene contemplation at Cathédrale Notre-Dame de Paris, and then examine the collection at Musee d'Orsay. Keep things going the next day: admire the landmark architecture of Arc de Triomphe, then shop like a local with Champs-Elysees, and then admire the landmark architecture of Louvre Museum. To find other places to visit, traveler tips, maps, and more tourist information, use the Paris trip planner . Singapore, Singapore to Paris is an approximately 16-hour flight. You can also do a combination of flight and train; or do a combination of bus and flight. You'll gain 7 hours traveling from Singapore to Paris due to the time zone difference. Traveling from Singapore in August, expect nights in Paris to be cooler, around 16°C, while days are slightly colder, around 29°C. Finish your sightseeing early on the 3rd (Fri) to allow enough time to take a train to Bayeux. Start off your visit on the 4th (Sat): contemplate the long history of Pointe du Hoc, then witness the site of a historic battle at Omaha Beach, and then explore the different monuments and memorials at American Cemetery & Memorial. On your second day here, admire the landmark architecture of Notre Dame Cathedral, then get engrossed in the history at Musee de la Tapisserie de Bayeux, and then get engrossed in the history at Memorial of Caen. To find other places to visit, traveler tips, reviews, and other tourist information, refer to the Bayeux driving holiday planner. Traveling by train from Paris to Bayeux takes 2.5 hours. Alternatively, you can drive; or do a combination of bus and train. August in Bayeux sees daily highs of 26°C and lows of 14°C at night. Finish up your sightseeing early on the 5th (Sun) so you can travel to Bonifacio. Kick off your visit on the 6th (Mon): make a trip to Escalier du Roi d'Aragon (King Aragon Steps), then kick back and relax at Santa Giulia Beach, and then kick back and relax at Plage de Palombaggia. 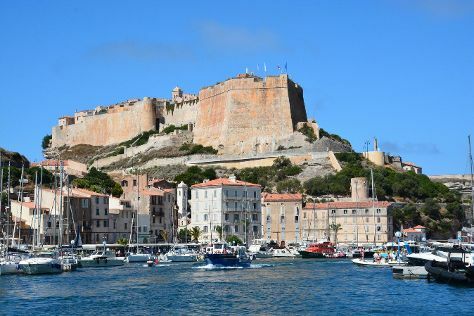 Get ready for a full day of sightseeing on the next day: tour the pleasant surroundings at Plage de San Giovanni and then steep yourself in history at Bonifacio Citadel. For other places to visit, reviews, photos, and more tourist information, refer to the Bonifacio trip itinerary tool . Do a combination of train, flight, and taxi from Bayeux to Bonifacio in 4.5 hours. In August, Bonifacio is somewhat warmer than Bayeux - with highs of 37°C and lows of 19°C. Finish your sightseeing early on the 7th (Tue) so you can drive to Calvi. Calvi is a commune in the Haute-Corse department of France on the island of Corsica.It is the seat of the Canton of Calvi, which contains Calvi and one other commune, Lumio. On the 8th (Wed), contemplate the long history of Citadelle de Calvi, then enjoy the sand and surf at Punta Spano, then enjoy the sand and surf at Aregno Beach, and finally kick back and relax at Arinella and Algaio Beach. You can plan Calvi trip in no time by asking Inspirock to help create your itinerary. Getting from Bonifacio to Calvi by car takes about 4 hours. Other options: take a bus; or do a combination of car and train. Traveling from Bonifacio in August, Calvi is somewhat warmer at night with lows of 22°C. Wrap up your sightseeing on the 8th (Wed) to allow time to travel to Avignon. Kick off your visit on the 9th (Thu): catch a live event at Arenes de Nimes, then explore the ancient world of Amphitheatre (les Arenes), then explore the historical opulence of Chateau des Baux de Provence, and finally admire the masterpieces at Carrieres de Lumieres. 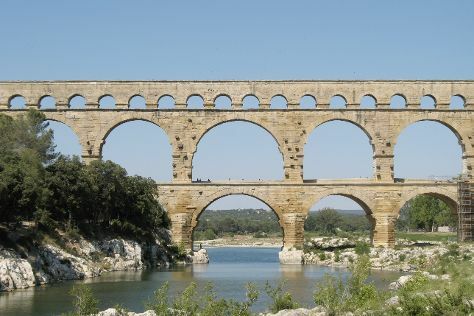 Here are some ideas for day two: snap pictures at Pont d'Avignon, step into the grandiose world of Palais des Papes, and then take in the views from Pont du Gard. To see other places to visit, ratings, maps, and more tourist information, read our Avignon trip planning site . Do a combination of flight and train from Calvi to Avignon in 3 hours. Alternatively, you can do a combination of bus and ferry; or do a combination of train and ferry. In August, plan for daily highs up to 35°C, and evening lows to 20°C. Wrap up your sightseeing on the 10th (Fri) to allow time to drive to Le Lavandou. Le Lavandou is a commune in the Var department in the Provence-Alpes-Côte d'Azur region in southeastern France. You'll get in some beach time at Plage de Gigaro and Plage de Jean Blanc. Escape the urban bustle at Plage de Sylvabelle and Grande Plage du Lavandou. Venture out of the city with trips to Plage de la Ponche (in Saint-Tropez) and Plage des Esclamandes (in Saint-Aygulf). There's still lots to do: tour the pleasant surroundings at Plage de Cavaliere and kick back and relax at Plage d'Aiguebelle. To find other places to visit, where to stay, and more tourist information, use the Le Lavandou online route planner . Getting from Avignon to Le Lavandou by car takes about 2.5 hours. Other options: do a combination of train and bus; or take a bus. Expect a daytime high around 33°C in August, and nighttime lows around 21°C. Finish your sightseeing early on the 13th (Mon) to allow enough time to travel back home.